1. Preheat the oven to 200°C, gas mark 6. Heat 1 tbsp oil in a frying pan, and fry the chicken for 4-5 minutes until browned, turning halfway through. 2. 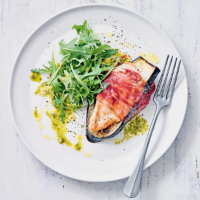 Top the aubergine slices with the tomato slices and then the chicken, season and wrap in a slice of Parma ham. Transfer to a greased baking tray and bake for 15-20 minutes, or until the chicken is thoroughly cooked with no pink meat. 3. Meanwhile, mix the pesto sauce, remaining oil and vinegar together, and toss into the rocket. Serve with the Parma chicken.